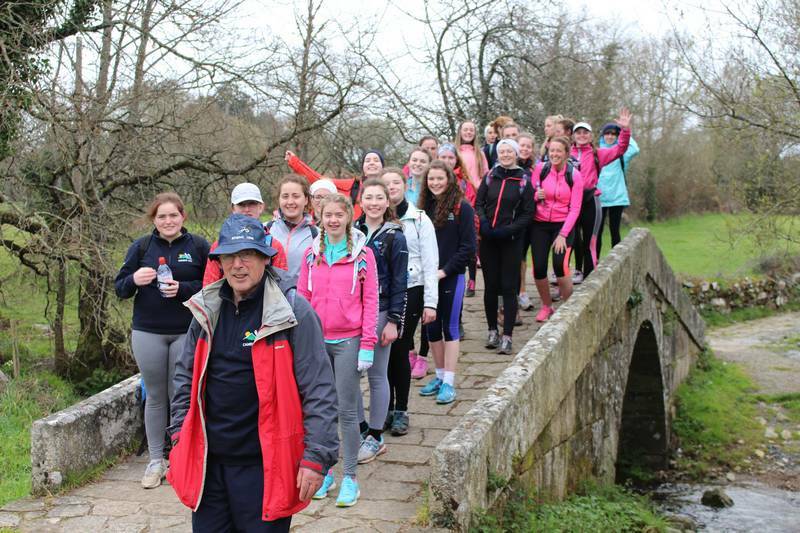 Excitement for the Camino all started months before our departure. 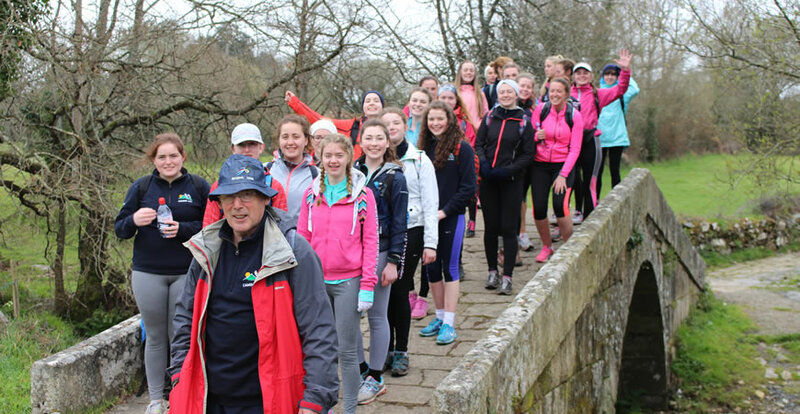 We were asked about our interest in the Camino back in September and safe to say there was a lot of interest considering there aren’t normally trips for fifth years. There ended up being a total of 29 girls going. The months past and we started preparing for the walk, admittedly the minority were preparing and the majority were planning on preparing at some stage in the distant future. The weeks and months passed and eventually we reached the colossal task of packing our bags. Now, it may sound easy to pack some sports clothes in a bag but when it comes to 16 and 17 year old girls one 10 kg carry-on suitcase may as well be a clutch bag. There were mountains of sweets and hair dryers to pack plus the essential kitchen sink. Luckily, the morning of our departure was not too early; we left at the reasonable hour of 8 o’clock singing our way to Dublin with our brand new Laurel Hill braids courtesy of Aislinn Condon’s mom. We arrived at the airport with plenty of time, keen to have a look around The Loop; not that beauty items would be necessary considering where we were headed. The airplane journey passed by very smoothly with lots of chatting about what was to come. We arrived safely and soundly in Santiago, in fact, we weren’t even sure whether the plane had left Ireland the scenery was so similar. After we picked up our bags we got onto the bus and began our journey to our starting point, Porto Marin. The bus journey gave us a sneak preview of what was to come all to the soundtrack of “American Pie” which was being played loudly on the radio by the bus driver much to our enjoyment. After about an hour and a half on the bus we arrived in destination number one, Porto Marin, an adorable little town and the starting point of our four day walk. During the afternoon, we got acquainted with our first hostel a large room with three groups separated by curtains and far too little sockets, it was like a giant slumber party with people we didn’t know. We also took a trip to the shop and bought more than what was needed because we couldn’t resist the low prices. That evening, we went for our first meal in Spain, we made do with our dish of what can only be described as tuna Bolognese. However, nothing could have surprised us more than when the waiter came out with our second main course of unidentified fish and unusual looking chips. Our first morning was a very frosty and cold one. We woke early and had a highly nutritious breakfast of a chocolate croissant with chocolate sprinkles and a glass of orange juice. We knew we had to complete a harmless 25 km today. It didn’t take long for us to regret our lack of preparation but we powered through keen to see our next village. As the kilometres completed clocked up we began to relax into our natural paces and the sun began to appear in the sky. We hadn’t a care in the world as we chatted and leisurely took in the picturesque scenery. The next morning we were greeted with more croissants and prepped ourselves for the more challenging task of 29km. Unfortunately, we had suffered a couple of casualties as we lost some our fellow walkers but we promised to stamp their passports along the way. We stopped in a lovely spot for lunch with the sun still bright in the sky and put an extra drop of sun cream on just to make sure. However, the sun cream was not needed, the heavens opened as we reached the base of the hill that our next village was mounted on. Safe to say, that evening there was a very long queue for the showers. Luckily as we were getting closer to Santiago the accommodation seemed to be improving. We even felt a little bit Spanish as we tucked into our dinner of Traditional Spanish Paella. On our third day of walking, we were gifted with a lovely day of lashing rain. In any other circumstances there would be no way we could leave the indoors on a day like this but at this stage we realised that we were invincible and nothing could stop us as we battled through whatever the weather threw at us. Much to our delight we stopped in a little café along the way for lunch. 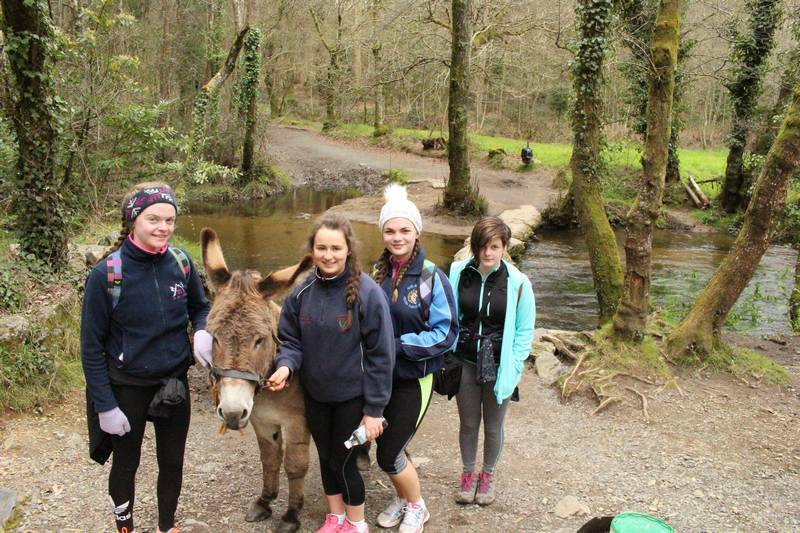 While there, we met a group of TYs from Wexford also walking the way. The little café was full of mementos and messages from those who had previously stopped there along their journey, it reminded us of the journey we were not only walking but also experiencing and even on this dull, dark day we too could pull through like those before us. That was not the only thing that kept us going along the way. We were also greatly appreciative of Caoimhe’s joke of the day and the sporadic shouting of cccccaaaaaaaaarrrrrrrrr kept us laughing even in the rain. 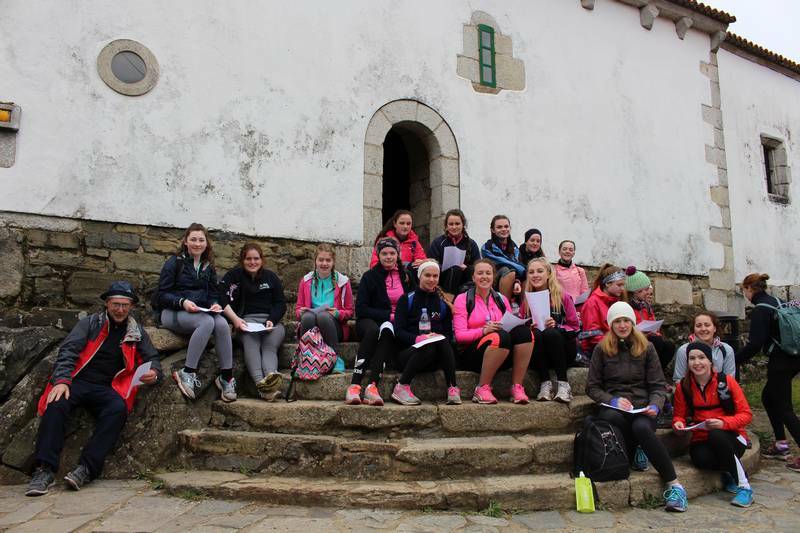 We were also very thankful to Sr. Geraldine and El for encouraging us to do a daily reflection as they helped us to experience it and remind us why we were walking the Camino. We even had some lovely songs during our reflection such as the aptly named The Climb. Our last night in a hostel was a very special one. We were all soaked after another day in the rain and we were all very tired due to our 70km completed. Due to a lack of service we ended up having a big chat and we felt as though everybody had become one big group rather than the several different little friend groups we started as. Dinner was also a special one because we got actual chips at dinner which we hadn’t realised we needed till we saw them. We slept soundly that night with thoughts of reaching Santiago the next day alive in our minds. Finally, we had reached our last day of walking, although we were tired and once again very wet, we just kept walking. There was definitely more silence on the last day maybe due to our lack of sleep or maybe down to us finally becoming comfortable with the silence. As we had lunch we began to think about it being our last day walking and we were actually getting a little bit sad that our time was coming to an end. But just as we were beginning to get upset the sun came out. Suddenly spirits were lifted and we even had a spot of religious yoga following our lunch. 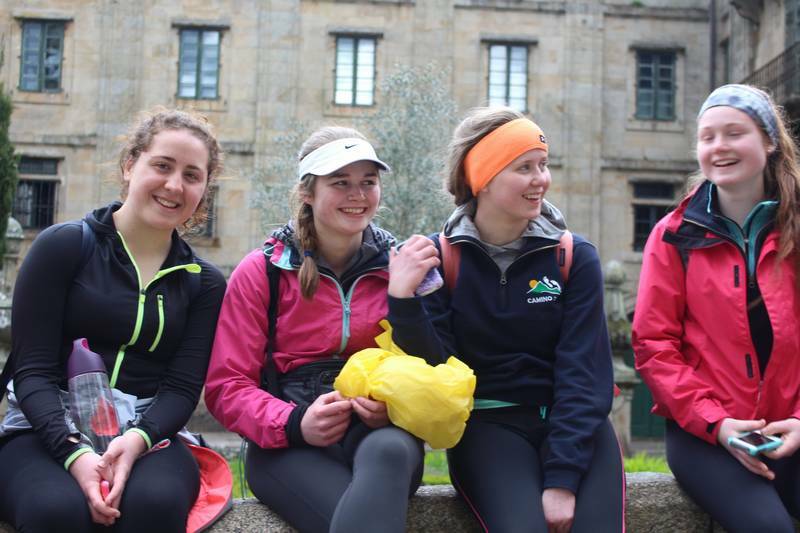 Perhaps the best time on the trip was our final few kilometres into Santiago. To put it simply we sang our way into Santiago smiling. When we finally reached the Cathedral Santiago de Comp Estella in the centre of the town, it was a picture perfect ending, huddled round the final stone in the ground singing our national anthem. 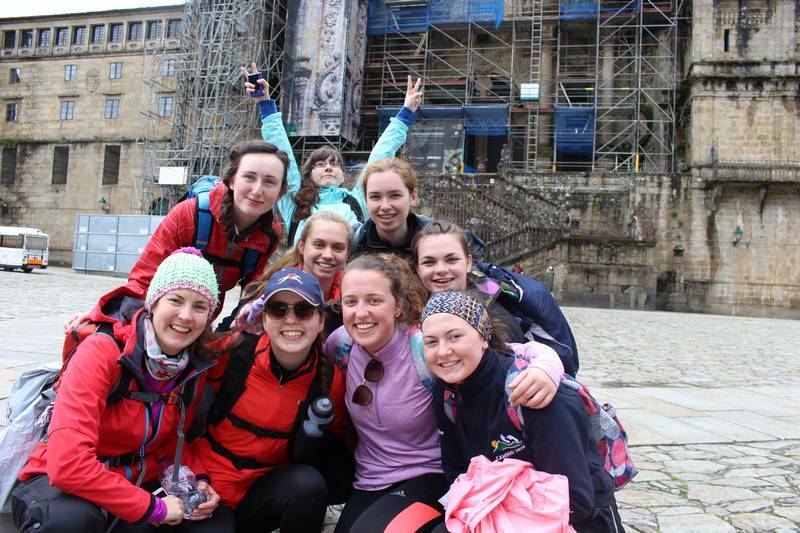 Personally, I can’t claim to be the most patriotic citizen but that was a special moments to have shoulder to shoulder with the Laurel Hill 5th year gals… even if everybody else in Santiago disagreed due to our very loud singing. When we arrived at our hotel for the night we couldn’t believe it, we had private en suite rooms, we were in the lap of luxury. That afternoon we got our certificates to say we completed our 100 kilometres. Turns out Irish names do not translate well to Latin. That evening we commenced our tour of Santiago and we found out that Santiago has some interesting Irish connections. Later on we had dinner in a school underneath the hotel and we got to meet the lovely FCJ nuns Katherine and Marion who run a centre in Santiago for those who have finished the Camino and need some respite at the end. Our last evening was a very enjoyable one and we had a great time relaxing in the hotel that evening. On our last morning we went shopping as we were determined to find the perfect gifts for our most distant of relatives. One of the traditions of the Camino in the past was to bring back a shell that was only available in the Galician region of Spain, which is where Santiago is located so as to prove you had walked the Camino. So safe to say we picked up a shell or two as proof of our journey as if certificates and blisters weren’t enough proof already. 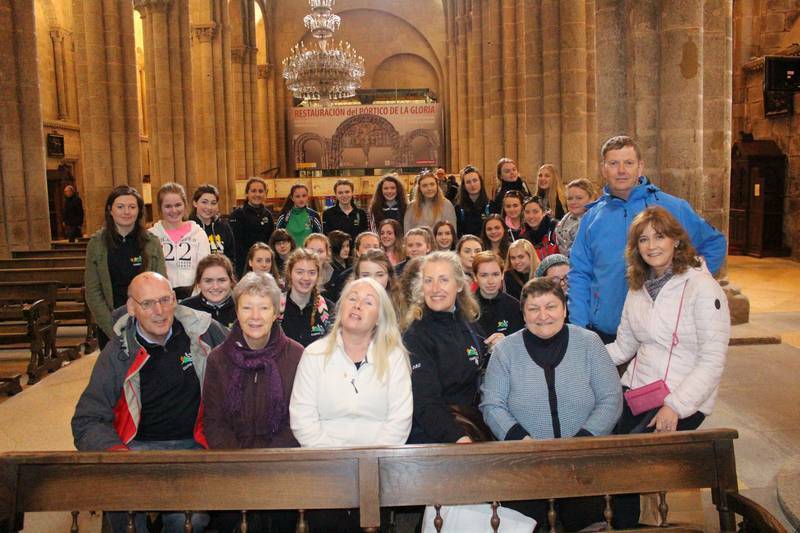 Following our shopping we went to mass in the beautiful cathedral although we were completely clueless as to what the priests were saying due to mass being in Spanish, however, it definitely was amazing to experience mass with other pilgrims. We also got to hug the statue of Saint James embossed with various jewels which sits behind the altar, a tradition in the cathedral. Afterwards we got our lunch and said our unfortunate final goodbyes to Santiago. Much to our delight we were greeted with the same bus driver on our trip back to the airport and once again we were treated to American Pie. However this time there was a twist with the next two songs played being Molly Malone and The Rose of Tralee. It was a strange but wonderful way to leave Santiago. Once again we had a great flight home as we dreamed of the Supermacs we had been longing for since day one. Finally we were back on Irish soil again and it was a beautiful evening to end the best trip. And just as we thought that our legs had done enough work and we pulled into Supermacs to get our much desired meals who pulled in beside us but Clements who had also been longing for their Supermacs meals after their Camino, luckily our legs pulled through for one final dash into Supermacs and everyone tucked into their meals. I think I can safely say on behalf of everyone that we would go back in a heartbeat despite the physical pain and I promise you there was definitely a lot of that. 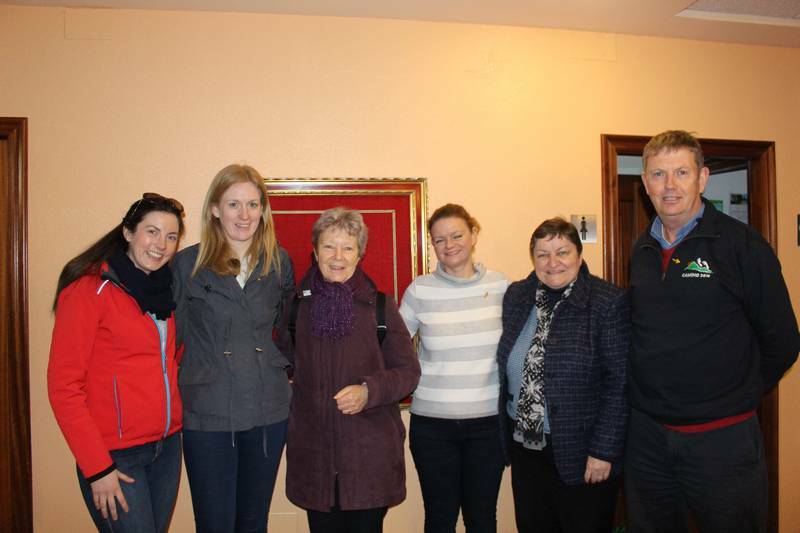 We would also like to say a big thanks to all of our travelling companions, Mr Cregan for his endless stock of medical supplies, Ms Ní Anragáin , Ms Leo and Ms McKeogh for the chats, the parents council members Diana, Sue and Rosaline for being our mums on tour and Board of Management member Liam for providing some much needed wisdom and humour but most of all I would like to thank the girls who went for making it the trip it was and I have one last thing to say Ccccccaaaaaaarrrrrrr.